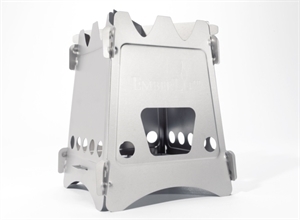 The EmberLit Stove “Original” weighs less than 11.3oz and is constructed of rugged 304 stainless steel. When you compare that to a full canister of fuel and burner for most “jet boil” style stoves, the difference in weight is astounding! The stainless steel EmberLit is impervious to corrosion and is remarkably strong. 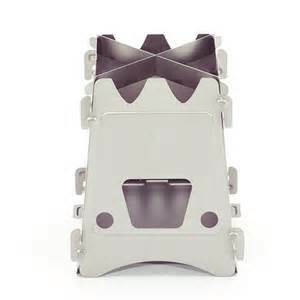 This camping or backpacking stove will hold the weight of any pot or pan that will sit securely without a wobble. Like the rest of the EmberLit line, this wood burning stove comes with a lifetime guarantee because you are never going to wear it out. With use, the individual panels that make up the EmberLit may take on a slight warp and become disolored. This is normal and doesn’t affect the assembly or durability of the stove. Great for backyard smores, camping, backpacking, canoeing, motorcycle/bicycle touring, river running, bushcrafting, wilderness survival, and disaster preparation. Made in the USA! The EmberLit is one of the coolest pieces of equipment on the market today for cooking in the. This little puppy is compact, lightweight, and extremely efficient. It weighs in at under 1 pound and folds flat. And when I say flat I mean it, it is less than a ¼” thick when disassembled. 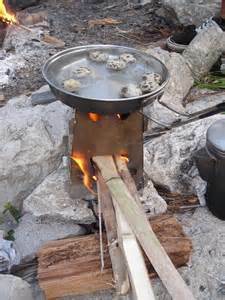 But the real advantage of this little stove is its efficiency. So I figured I should put it to the test. I started with the stove and a stainless steel GI canteen cup. I put 2 cups of water in the cup and built a fire in the stove. Now, “fire” is a relative word in this case. I collected a very small handful of twigs from around the yard. I am talking fine fuel to maybe the size of a pencil. The whole bundle is maybe 4” or 5” long and slightly thicker than a shovel handle. I built the fire, put the cup with water on the stove, and shoved in the twigs as they burnt down. I had the water boiling in under 3 minutes! I then added a cup of the hot water to my Mountain House pouch and made hot chocolate with the remaining hot water. Now that is the way to cook. I have two of these little beauties and I just think they are the best thing since sliced bread for getting water boiling quickly or anytime fuel may be limited like it is here in the desert southwest.